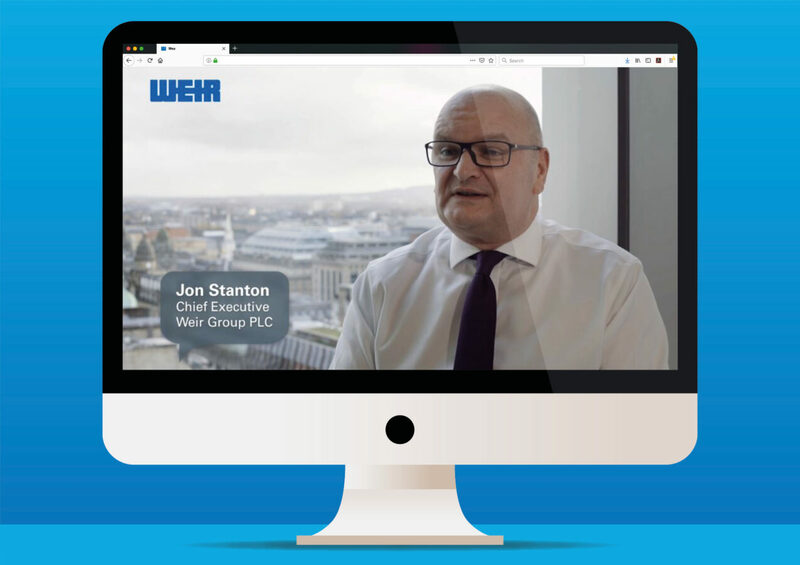 Weir, one of the world’s leading engineering businesses, came to us looking for help successfully launching their first ever global employee survey. 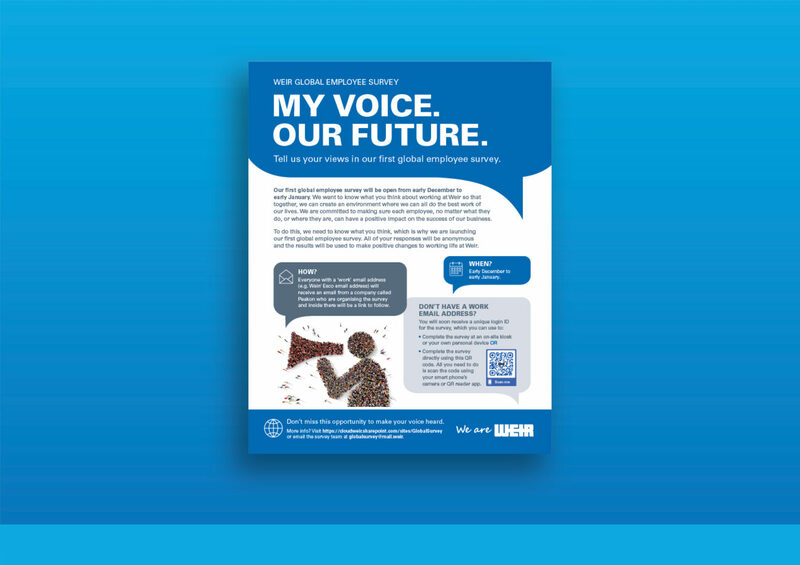 As well as encouraging all employees to complete the survey, we needed to promote it as the start of a positive cultural change at Weir, marking the beginning of an ongoing two-way communication with their employees. 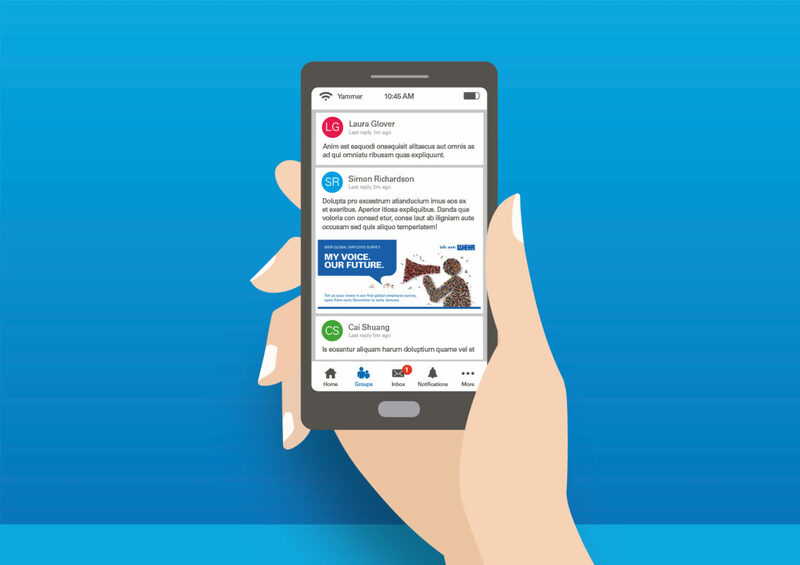 The Brief: Weir needed us to create an engaging concept for their first global employee survey and encourage maximum employee participation. It was important that we promote the survey as being the beginning of a positive cultural change within the business. Weir were keen to make their employees feel valued, no matter what their role in the business or where they were located. We also needed to support managers in encouraging participation and feed back results at a local and global level. The Challenge: Weir is one of the world’s largest engineering businesses, serving mining, infrastructure, oil and gas customers in more than 70 countries. The global survey was the company’s first major push towards a global vision, despite its decentralized structure. Weir’s employees number in excess of 15,000 and are based all over the world, in a vast range of roles and some extremely remote locations. They needed a really impactful communications campaign to ensure all employees would get the message and feel inspired to take part. 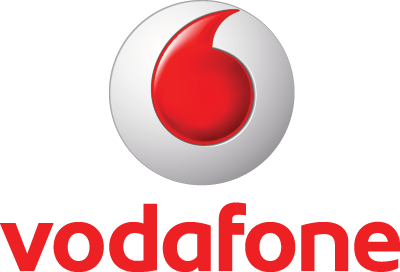 The Solution: One of the required outputs of the global employee survey was to produce a thorough and targeted internal communications strategy for the future, so it was essential the survey itself attracted as much attention as possible. 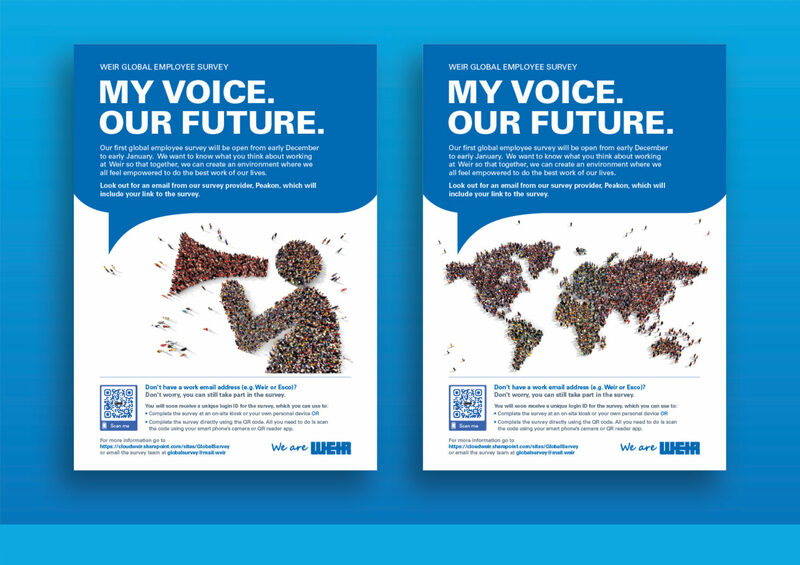 We devised a project identity, creating key messaging and the strapline “My Voice, Our Future” We produced emails in 16 different languages to promote the survey and emphasise to all employees that the point of the exercise was to help create an environment where everyone’s voice matters. This message was supported with posters, flyers and a video statement from Weir’s CEO. Managers were provided with support to encourage participation from their teams as well as town hall slides which promoted the “We are Weir” vision of becoming the most admired engineering business in their markets. 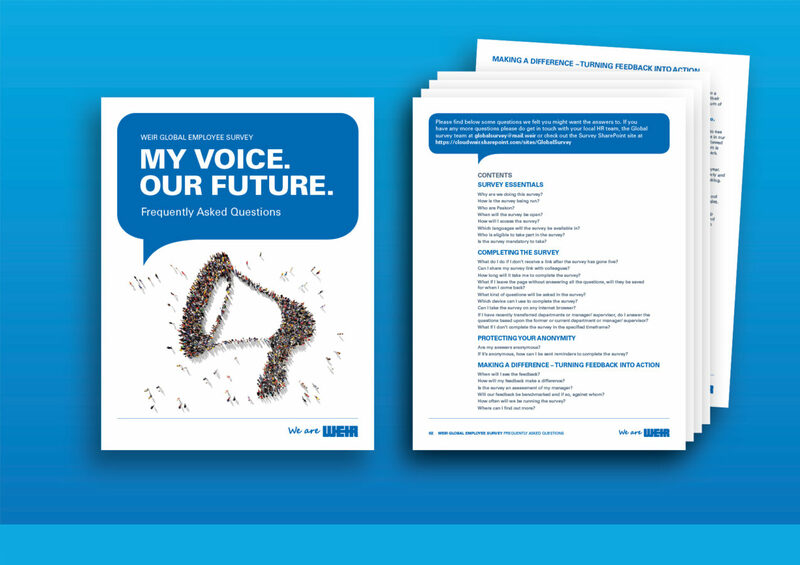 It was vital to empower employees by letting them know it was their voice that needed to be heard in order to inspire a positive change. This point was highlighted across all messaging. Using an external company to run the global employee survey on Weir’s behalf helped reassure employees that their responses would be anonymous. The nature of many employee’s roles meant they would not necessarily have access to a work computer, so kiosks were set up at locations around the world which enabled those employees to take part in the survey as well as a QR code which could be scanned to enable employees to complete the survey on their mobile devices. Results of the survey were fed back at a local and global level and conclusions from the survey were then presented at a board meeting in December 2018. Outcome: 84% of employees took part in the survey – a fantastic result which Weir were extremely pleased with, especially given this was the first survey of its type. 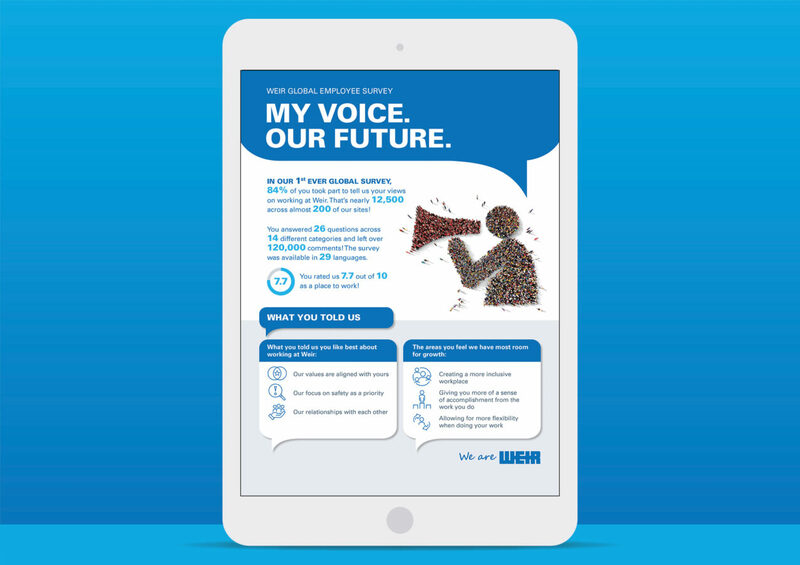 As a result of the survey Weir clearly care about the welfare of their employees and want them all to feel that their voice can be heard and will be listened to. Due to its success, Weir are planning to run a second survey this year in order to maintain an open dialogue with all their employees. Our global communication campaign allowed us to achieve an incredible 84% participation in our first ever global survey, which we were particularly proud of given our geographical spread and high percentage of non-digitally connected employees.